Conduction is another method of heat transfer. Conduction enables heat to travel through an object or between two objects in direct contact with each other. The rate of conduction depends on the object's density. The denser the material, the faster the conduction rate. Insulation filled with air makes an excellent component to block conduction. An insulation's performance is tested and given a measurement known as an R-Value. The R-Value is the resistance to heat flow. Most homes feature cellulose based insulation products that tend to settle over time. As a result, older insulation loses its R-value and becomes inefficient at reducing heat transfer / conduction. Chances are your home is in need of an insulation upgrade. 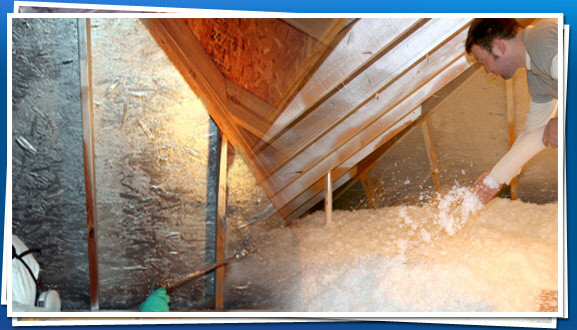 Attic Comfort utilizes a Formaldehyde-free, blow-in loose fill fiberglass insulation as part of our Comfortable Attic Program. Unlike cellulose based insulation, our insulation only settles 1 to 3 percent and won't lose R-value after installation. improves indoor air quality because it's made without formaldehyde.